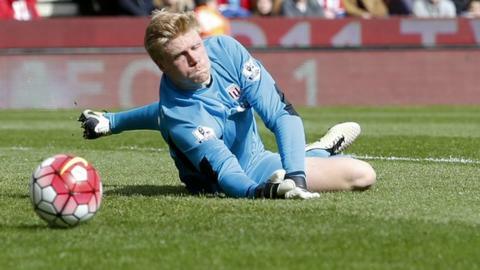 Stoke City boss Mark Hughes says he is "comfortable" with his goalkeeping options and is prepared to switch between Jakob Haugaard and Shay Given. In the absence of injured number one Jack Butland, 23-year-old Haugaard has started the last two Premier League games but has conceded six goals. "It's a fluid situation," Hughes told BBC Radio Stoke. "We've lost a top goalkeeper, but we have two outstanding keepers that can come in and do well for us." With England international Butland out for the rest of the season with a broken ankle, the spotlight has fallen on his immediate replacement Haugaard. The summer signing from Danish side FC Midtjylland made his Premier League debut in Stoke's 2-2 draw against Swansea, which was followed by a 4-1 defeat at Liverpool. Veteran Republic of Ireland international Given, 39, has made two League Cup appearances since joining the club from Aston Villa on a free transfer and last played a league game in Villa's 6-1 defeat by Southampton last May. "If I think I need to change then I will do. If I think one option's better than the other, that's my job," Hughes said. "I'm quite comfortable with the situation, I know I've got two good goalkeepers. "If Jakob plays he'll be expected to play well and if Shay comes in we'll expect him to play well too - there's always a demand on the person in possession of the shirt." Stoke, who are five points outside a potential European place for next season, take on title challengers Tottenham at the Britannia Stadium on Saturday.